RIVERSIDE, Calif. --- Due to an emergency relocation from Black Rock Desert, Nev., Burning Man, the notorious weeklong festival which draws tens of thousands of hippies and hipsters annually, will this year be held at what organizers are calling "the only other logical venue": La Sierra University. The event, which gets its name from the climactic ritual burning of a huge wooden effigy, is marketed as an experiment in community, supported by dramatic displays of self-expression and self-reliance. 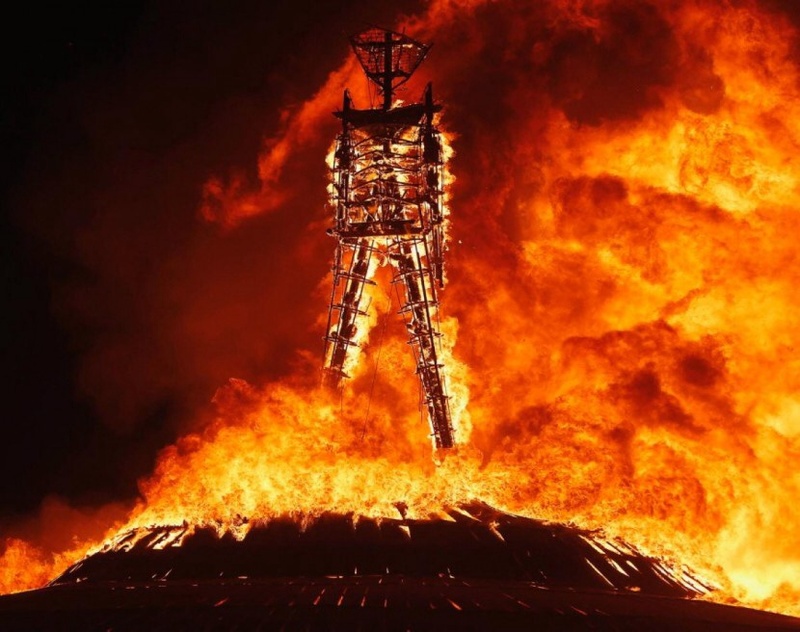 The relocation of Burning Man was forced by growing political opposition to the event in the Nevada legislature, which was, in turn influenced by local protestors who object to the event's wild partying and the risk for environmental damage posed by massive fire art displays. Organizers are hoping that the harshness of the Riverside heat and smog will help simulate the event's traditional Black Rock desert conditions. "In Black Rock we instruct attendees never to leave camp without water, goggles and a dust mask. Now that we are moving the event to Riverside, these basic precautions are even more essential," said Fuego. "We needed a different location that was equally arid but far less expensive to restore should the torching of our Burning Man statue get out of hand," said event organizer, Fuerza del Fuego. Although she admitted that her team has "a few wrinkles yet to iron out" with the Riverside Fire Department, Fuego is optimistic that the event will go ahead as scheduled in the last week of August this year. Anticipating roadblocks from La Sierra administrators objecting to overly-dramatic attendee dress (or the complete lack of it), Fuego said that Burning Man 2015 participants would be asked to limit themselves to self expression that respects the modesty requirements of the university. "We hear there isn't much of a dress code anyway," said Fuego. La Sierra administration, faculty, staff and students have all received free passes to this year's festival as thanks for the generous gesture of allowing the event to be held at the university. According to organizers, 90 percent of La Sierra's combined population have personally visited the Los Angeles organizing branch of Burning Man to claim their tickets. "Truth be told, we recognized just about all of the La Sierra crowd that came in from their enthusiastic attendance in years prior," said Fuego. Clever name for the “event organizer, Fuerza del Fuego.” That fire surely will have some force! Having Burning Man at La Sierra will surely be a New Revelation for many Adventists! And the Burning Man does surely conjure up images of the Lake of Fire! The organizers should have nothing to worry about, since 90 percent of La Sierra’s combined population–allegedly including administrators–have already claimed their free tickets. Unless, of course, the missing 10 percent are the administrators–but, from what I’ve heard, the administration were probably among the first to grab their tickets. Definitely a foreshadowing of the Time of Trouble. Dang California. The “Burning Man” is too close to the KKK burning a cross. Nix the whole thing before certain civil rights activists get wind of this event. Woe is me!! What have our Universities come too. They are close to bottomless pit. If this is true.Satan has they in his clutches already.